By some measures Kicad is the most popular PCB computer-aided design (CAD) open source software in the world. As a result it is no accident that it’s got some of the best documentation out there. If you look for the documentation in the help menu in the main Kicad window, will receive a message that the help file was not found. The documentation wasn’t installed. And same thing happens when getting help. These resources don’t come by default with Kicad and I actually rather go to the web to find help instead of relying to the built-in help system that comes with the application. 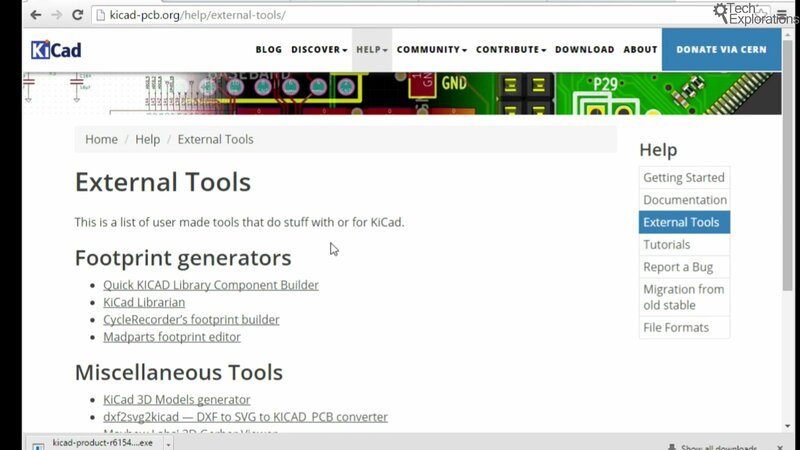 To get help go to main Kicad website or http://kicad-pcb.org/help/documentation. In this locations, there are several resources that you can access. There is a getting started guide, which comes as a PDF document that you can download. 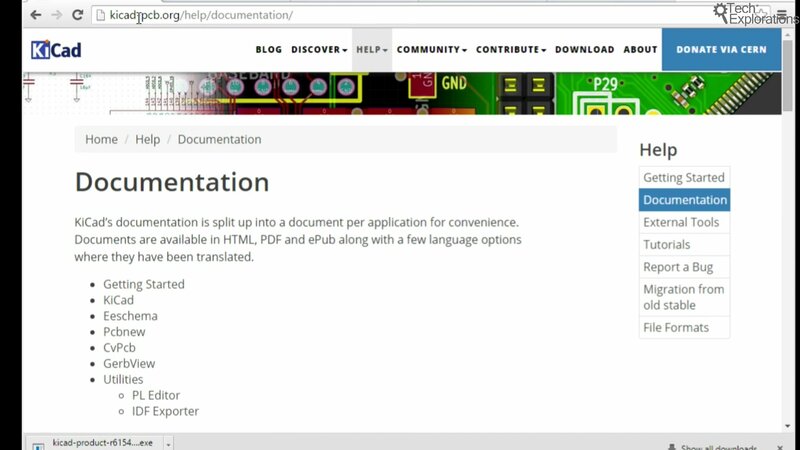 There is also documentation that can help you with the individual applications that come with Kicad, and is available in several languages. There’s documentation for EEschema and PCB new etc. Some of the documentation in these resources may be a little bit old since the Kicad developers release new versions and updates frequently. Therefore, keep in mind that some of the documentation maybe lagging behind the software, especially for newly released features. Having said that, the main features in Kicad don’t change much between releases, so the documentation for these features is mostly valid. We also have external tools – so going into that – and you can see various editors and libraries and footprint, builders and 3D model generators and so on. These are things that you will become interested in due course, as you become used to the work flow in Kicad and familiarise yourself with the features of Kicad. Once you start looking for more advanced capabilities remember to visit this page. 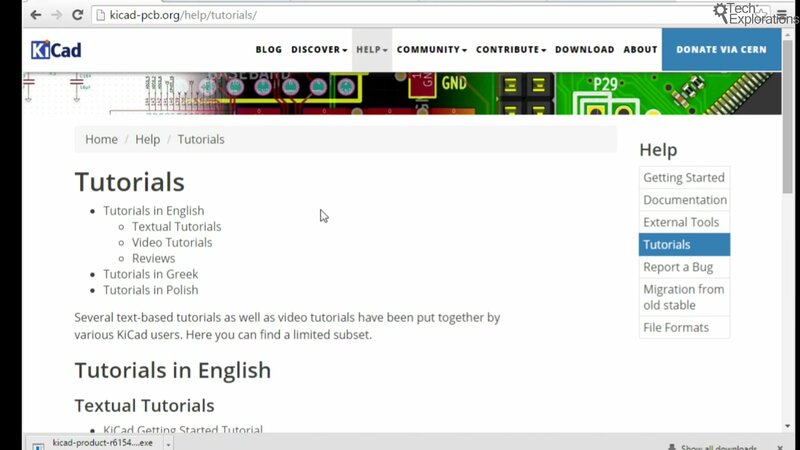 You can also look for tutorials. 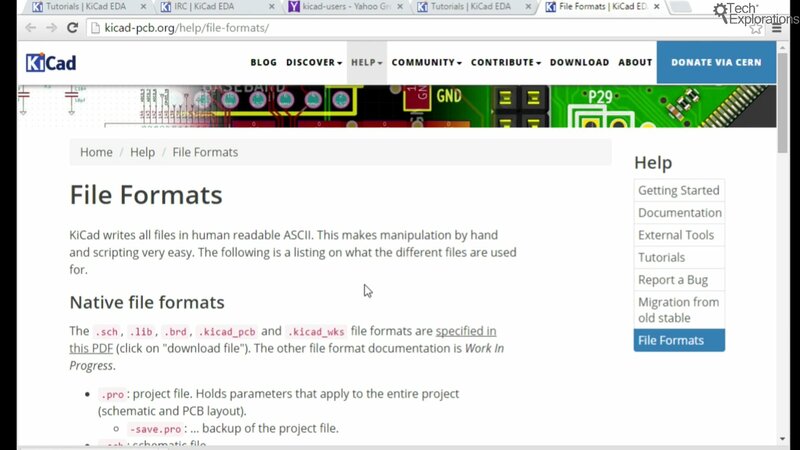 Kicad users have documented their experiences in the form of tutorials that you can learn from. So, apart from this book, these are great resources for you to keep in mind. 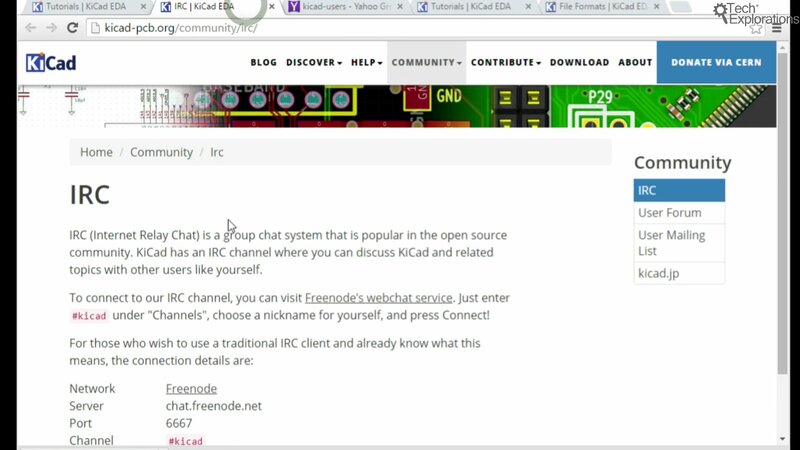 If you are looking for almost real-time help, it’s good to know that there is an Internet Relay Chat (IRC) channel, frequented by very experienced Kicad users. This IRC channel is very useful in case you have a question and need a quick answer. There’s always somebody to talk to in this channel, who can help you out. 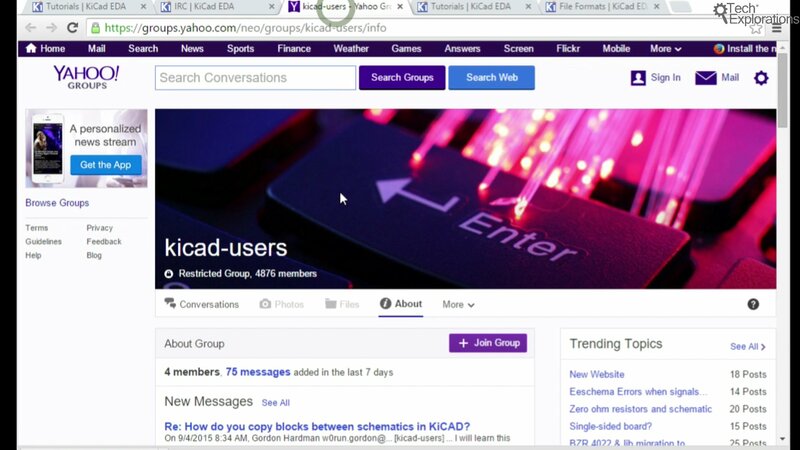 There is a fairly large Kicad users group on Yahoo, counting almost 5,000 members. To join it you must make an application, and you will be allowed access. This group contains a lot of very interesting conversations that can help you with a lot of problems. Another very nice resource is the documentation for the various file formats that Kicad uses. 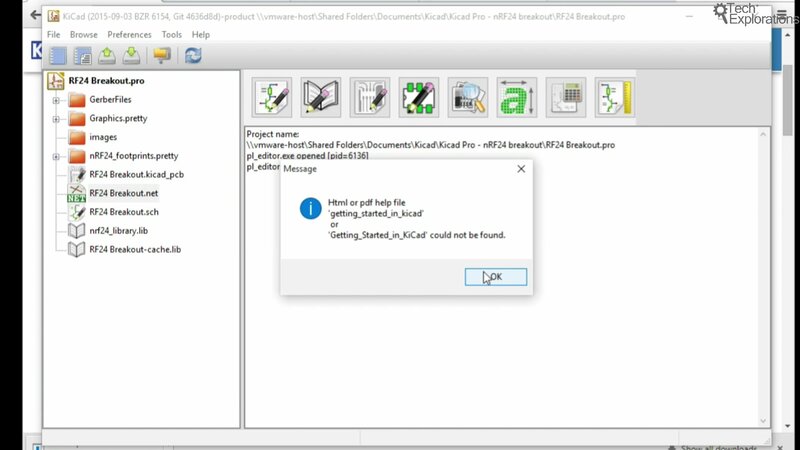 As you had a glimpse of earlier back in the main window of Kicad, you see that there are a lot of files that are exported and created by Kicad and you will need to figure out what each one of those files is eventually. Here you will learn, for example that a “.pro” file is the project file that contains overall project information. There are schematic “.sch” files, “.lib” library files, “.mod” for footprints and so on. In the next chapter we will have a look at the printed circuit board, and discuss what a PCB is, it’s features and components.